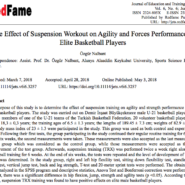 The purpose of this study is to determine the effect of suspension training on agility and strength performance in elite male basketball players. The study was carried out on Demir İnşaat Büyükçekmece male U-21 basketball players who are the members of one of the U-21 teams of the Turkish Basketball Federation. 20 volunteer basketball players with age of 18,3 ±0,3 years; the training ages of 6.5 ±1.3 years; the lengths of 189.45 ±7.3 cm; weights of 82.9 ±7.8 kg and body mass index of 23 ±1.3 were participated in the study. This group was used as both control and experimental group. Following their first tests, the group participating in the study continued their regular routine training for 6 weeks. After six weeks, the second measurements were taken. These measurements were also accepted as the last measurement of the group which was considered as the control group, while those measurements were accepted as the first measurement of the test group. Afterwards, suspension training (TRX) was performed twice a week right along with basketball training for 6 weeks. At the end of six weeks, the tests were repeated and the level of development of the test group was determined. In the study group, right and left hip flexility test, sitting down flexibility test, standing long jump test, vertical jump test, back and leg strength, T-test and 20-meter sprint tests were performed. The obtained data were analyzed in the SPSS program and descriptive statistics, Anova Test and Bonferroni correction were performed. As a result, there was a significant difference in hip flexion, jump, strength and agility tests (p <0.05). According to these results, suspension TRX training was found to have positive effects on elite male basketball players.